Overview to the product programme - natur-apothekes Webseite! Alen: Highly qualitative food supplement for healthy cell growth and body detoxification. and trace elements, 20 vitamins and 18 amino acids. A scientifically generated, holistic food under use of grain, vegetables and seaweeds. The nutrients are extracted from an intact and nutrient-rich environment of the Andes and the Galapagos Islands. EVELIZA: Nutrient concentrate in powder form to the reconvalescense of nutrition-conditioned diseases. Product contents: wide nutrient spectrum from 20 minerals and trace elements, 20 vitamins and 18 amino acids. Balance of a serious undercare with nutrients (grain, vegetables and seaweeds) in case of signs of decay of the body. Activate the energy production in the mini-power stations of your body cells. Vital Q10 Forte consists of Coenzym Q10, jelly royal, selenium, zinc, vitamin E and Betacarotin. Natural improvement of the heart functions after stroke, cardiac infarction and improved oxygen care of the heart. Ervamatin: A natural hair-restorer with impressive results. Ingredients: Special natural substances from the Brazilian Amazon Rainforest. After the treatment of the scalp grow again strong hairs - also with the problem of alopecia. It is a nutrition of the hair roots instead of the usual chemical treatment. VERVE: A drink for a healthy energy push which fills up the body fast and which increases concentration. The tasty energy drink consists of the exotic fruit remedy Mangosteen, kiwi, strawberry, Guarana, green tea, aloe and high-quality mineral water. VERVE is the first healthy lifestyle drink with the patented formula for a highest possible bioavailability of the nutrient spectrum in the body. VEMMA: Liquid nutrient concentrate with excellent qualities as a natural remedy. The perfect health cure by varied vitamins, minerals, the natural fruit remedy Mangosteen, Xanthons as well as organic aloe and green tea. 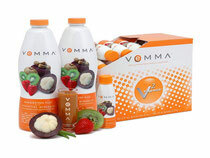 VEMMA promotes the health and counteracts against numerous diseases. VEMMA fights against free radicals and against inflammations in the body and repairs damages. Thirst: The sports drink with quick energy availability and remedial effect. Ingredients: Ultra-hydratizing mix from electrolytes, protein-forming key amino acids, special carbohydrates, minerals, vitamins and the natural fruit remedy Mangosteen. Healthy hydratizing for sportsmen without usual sweeteners and artificial colorings. In contrast to sports drinks Thirst delivers an entire spectrum of vitamins, vegetable mineral substances and Mangosteen.